It’s not always great to be out in the rain, but photography in an abandoned building during or just after a rain storm can create some great opportunities like this. It rained for days prior to our arrival and was raining while we visited. So there were a bunch of great opportunities for reflection shots like this one. This was an abandoned factory in Detroit Mi. Its hard for me to believe that it has been over a year and a half since our trip to South Africa. How did that happen? I guess that’s just how it works…. As they say, time flies. 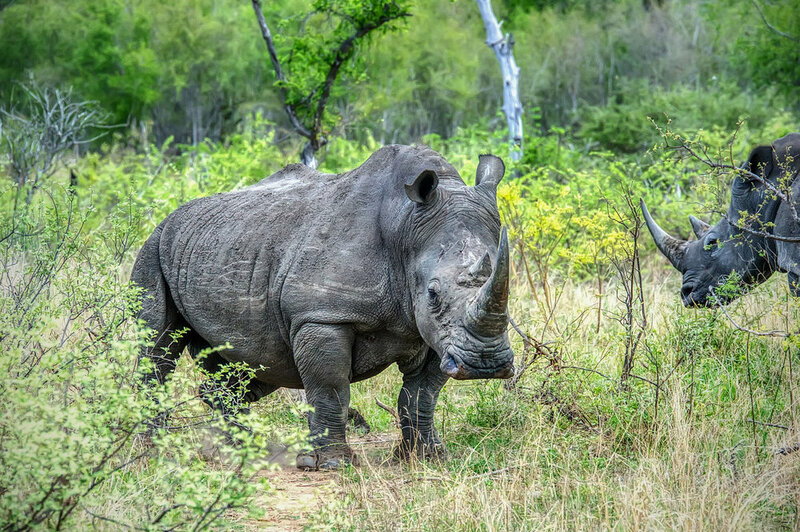 Anyway, tonight I have a photo of a two Rhinos from that trip. What a great experience….. I’m still thankful to our guide (Henk) and all the great travelers in our group who all helped make the trip a wonderful. This beautiful spot (Tulum Mexico) is just that…beautiful. The beach was a great spot to hang out and just relax. I love this photo. I need to plan another urbex photo walk in the near future. I am so ready to spend a little time in a new (to me) abandoned structure. There is something about the exploration of these sites that I really enjoy. I have something planned in May with a few friends, but that seems so far away. Until then, enjoy this photo from inside a Detroit factory. I’m not sure what these curtains were used for in the past, but I thought they made for a striking photo. During our trip to Mexico we stayed at Grand Palladium Resort north of Cancun…I’ve mentioned this before. Inside the resort, there are a number of restaurants, bars and stores all of which have a different theme/design. One of them is a Café and deli, which was designed as a urban contemporary look that included this giant floor to ceiling mechanical clock. This clock ran all kinds of pulleys and cables that helped other objects in the Café run/move. In fact, the mannequin on the bike in the left corner of this photo was run by the clock. His legs pumped the bike peddles that turned the wheels. I liked the clock and the entire Café. I don’t make a big deal out of it, but I’m an Affiliate of Skylum software. They make some of the best photo editing software in the world. Applications like Luminar, Aurora HDR, Photolemur, and now the brand new AirMagic. What does it mean to be an Affiliate? Basically, I get a discount on their software in exchange for promoting the products. Admittedly, I’m not very good at this. I don’t feel great about pushing products on people. So I try to be fair…. I don’t take advantage of Skylum and I try to be transparent to all of you. Thus I’m telling you I am an Affiliate. And as a reminder (I’ve talked about that in the past), I’m an Affiliate with ThinkTank camera bags as well. So why am I sharing all of this? Well they created a super easy photo editing software application called Photolemur that I’ve been using for over a year. It uses Artificial Intelligence (AI) to do all the major editing for you. Honestly, I like it and have been using it a ton. Skylum recently announced a new application called AirMagic. This new software application is designed specifically for drone photography. It works very similar (from a work flow perspective) as Photolemur. You drop the photo or photos you took into the app and it uses AI and advanced algorithms to edit your photos perfectly. After using Photolemur and AirMagic, the only remaining editing I do is pull them into Photoshop (…you can use your favorite software) to slightly sharpen and crop (if necessary) the image. Note: I’m a really big fan of sharpening photos…. So that step might not be important to you. 1. Drop the image into AirMagic and save the software’s final product. 2. Pull the image in Photoshop to Crop (if needed) and sharpen. By the way, you can see a sample before and after images below that I took with my drone. Before: RAW image right out of the drone. I haven’t posted a Detroit photo in a while, so here we go. We had a hit list of Detroit Urbex locations to hit up, but we also explored some sites that we randomly found, just driving around. That’s the story of this spot. We went to the Michigan Central Station (the building outside the window) to photograph the area around it. During that time, we found this abandoned beauty with great views like this photo. I took a bunch of window photos like this one at this spot. I couldn’t think of a clever name for this blog post. Frankly, I’ve never been good at that. I see other photographers posting extremely clever names for their photos and blog posts. That’s just not me. I guess I’m just not that funny. How would you label this post? Regardless of the title, I really like this photo of the National Mall in Washington D.C. I got extremely lucky to find this spot without dozens of tourists standing in my photo. Well its official. Antonio Brown is being traded from the Pittsburgh Steelers to the Oakland Raiders. He’s taking his extremely good football skills and over-heated ego to the west coast. He was also quick with his giant smile. It was fun watching him play over the last seven years while I covered the team. I wish him the best. I like this city photo a bunch and I’m not really sure why. Its probably just the contrast between the old building and the new skyscraper in the background. I took this last fall while I was in San Francisco. I spent probably 8 hours over three days just walking around the city capturing random photos here and there. It will be interesting to see if you like it as much as I do. There are photos I expect to get lots of love that do and others that surprise me and don’t. But I don’t know what to expect with this one. So let’s find out. Here is another newspaper article about Blair and I traveling to Chernobyl to photograph the Exclusion Zone. This is from my childhood hometown paper. Click HERE to see the article. What a beautiful spot!! I took this photo with my drone while traveling north of Cancun. The beach was amazing along this stretch. I think I need a vacation home in this area. Anyone want to back that project for me? This massive statue sits on top of the National Museum of the History of the Great Patriotic War (1941-1945)…we know it as World War II. This stainless-steel statue is 203 feet tall. Counting the museum building it sit on, the entire structure is 335 feet tall and it weighs 560 tons. The sword in her right hand is 52 feet long by itself and weighs 9 tons. That’s a huge statue by any comparison!! The State Emblem of the Soviet Union is on the shield. Even though this war ended in 1945, they didn’t start the construction of this statue until 1979 and it was completed in 1981. In Kiev, Ukraine where this is located, the statue is controversial due to Ukraine’s complicated and currently rough relationship with Russia. Blair and I spent a few hours walking around this national park photographing the war monuments, tanks, etc…. If you’re wondering, the blue and yellow tank in the foreground is painted the Ukrainian colors. What do you think of this photo? It’s one of those photos that I like but am not sure whether anyone else will like it or not. This pile of gears was inside the main building at Carrie Furnace. I liked this perspective with all the gears going from the foreground to mid photo with the rest of the industrial building in the back ground. Anyway… thoughts on this? To view a larger version, click HERE. I took this photo with my drone a few months ago in downtown Pittsburgh at dawn. The site wasn’t really even awake yet. This is a perspective not seen often. I like the leading lines with the road heading towards the Highmark building and the road along the river. This summer camp outside of Chernobyl had dozens of these little cabins with fun little murals painted on their sides. We spent a little time walking around exploring what must have been a great time back when it was operational. The camp sits on a hill overlooking the Pripyat River. This was probably a very happy place prior to the nuclear disaster. I scrolled through numerous photos in my archive tonight looking for something to post. I came across this photo I took while on one of our cruises. Per my normal process, I was up before 99% of the passengers trying to capture the ultimate sunrise photo. I don’t think photo falls into the ultimate photo category, but I like it a bunch. How is your week going so far? I can’t believe Wednesday is already over, that tells you how busy my schedule has been. So I’ll keep this short tonight. I took this photo on our water safari in South Africa. I loved how the hippo looked with the sunset behind it. I flew my drone a long way down the Pripyat River to capture this photo. I honestly don’t remember the distance, but I can tell you it was far enough that I got nervous. My drone was losing reception and acting weird. When it started to fly back to me, I started to feel better again. Thankfully, I captured this photo before it started acting up. These cranes are abandoned on the river a short distance from the Chernobyl Nuclear Power Plant in Ukraine. What can I say about this photo that is doesn’t say by itself? Probably nothing!!! Let’s just sit back and enjoy it. I took this photo, along with a bunch of others, with my drone flying back and forth low along the beach. I love the colors and feel of it.